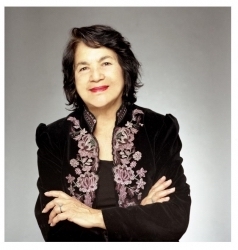 Learn more about United Farm Workers co-founder Dolores Huerta, in the new documentary film, Dolores, which will screen at the Menlo Park Library on May 15 at 6:30 pm. Huerta, who led the fight for racial and labor justice alongside her better-known co-founder Cesar Chavez, is profiled in this documentary directed by Peter Bratt. Huerta, still active at 88-years-old in her community service and advocacy for the rights of workers, immigrants, and women, has been the recipient of honors including the Eleanor Roosevelt Award for Human Rights and the Presidential Medal of Freedom. She was also the first Latina inductee into the National Women’s Hall of Fame. This is one of a series of events in association with the traveling exhibition Wherever There’s A Fight: A History of Civil Liberties in California, on display throughout April and May 2018 at the Menlo Park Main Library.